Enjoy a slice of Sun Valley tradition in the historic Ram Restaurant! Take in the views of the Village from an intimate booth in our cozy dining room and enjoy Larry Harshbarger’s piano melodies and Sun Valley history. 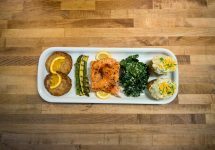 This season’s menu puts new twists next to familiar favorites, featuring Snake River Farms strip loin and wild king salmon, alpine fondue, fresh diver scallops, and Northwest lamb. The Ram is a great place to warm up after a day on the slopes and a favorite of locals and tourists alike! Walking into the Pioneer Saloon in Ketchum is like greeting an old friend. It’s often the first stop for locals coming home or visitors starting a memorable vacation. For more than 50 years the Pioneer has been welcoming its loyal customers with a warm and cozy atmosphere that feels more like someone’s home than a restaurant. Walking down the stairs into this traditional pub is a right of passage for any visitor to Ketchum, along with downing one of the establishment’s notorious Moscow Mules, served cold in a copper cup (so precious, one must leave their credit card as collateral for ordering the drink). 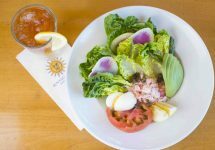 A mecca for health and healing, Glow Juice Bar & Café is an organic and local foods café and health food store in Ketchum, Idaho. Glow specializes in fresh and delicious appetizers, sandwiches, entrees, decadent desserts, refreshing cold-pressed juices, kombucha on tap, superfood smoothies, as well as a case stocked full of to-go items.